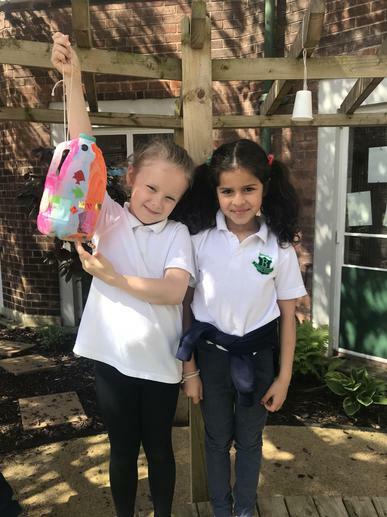 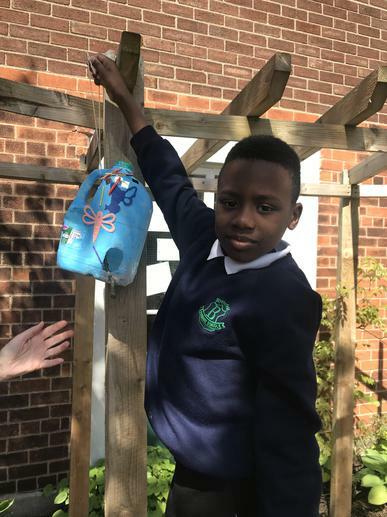 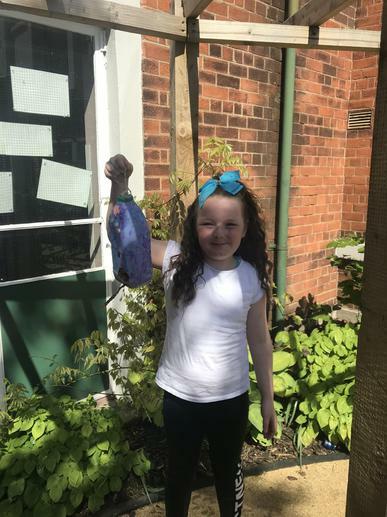 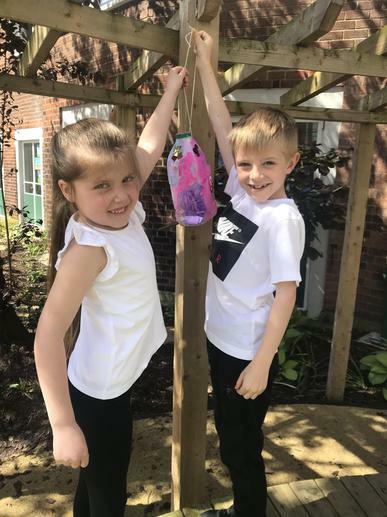 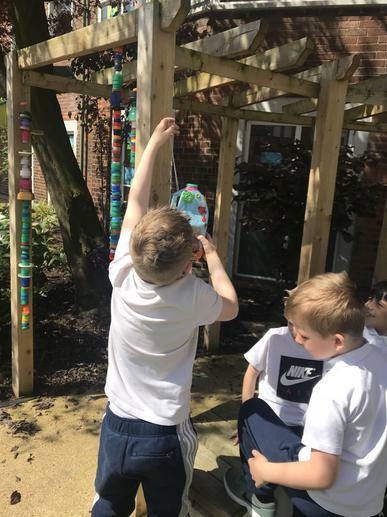 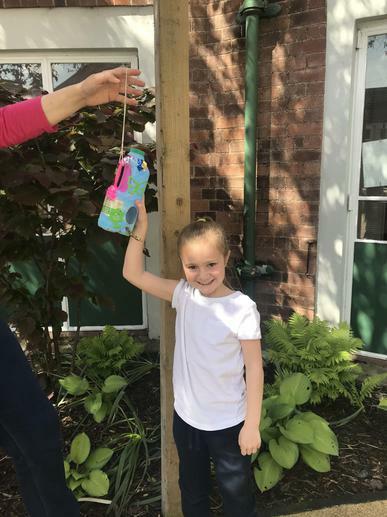 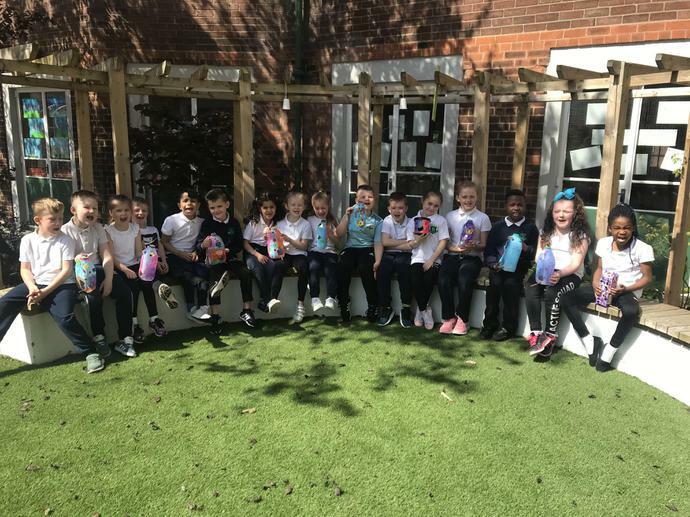 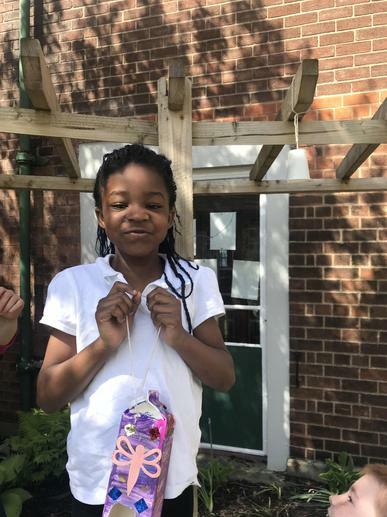 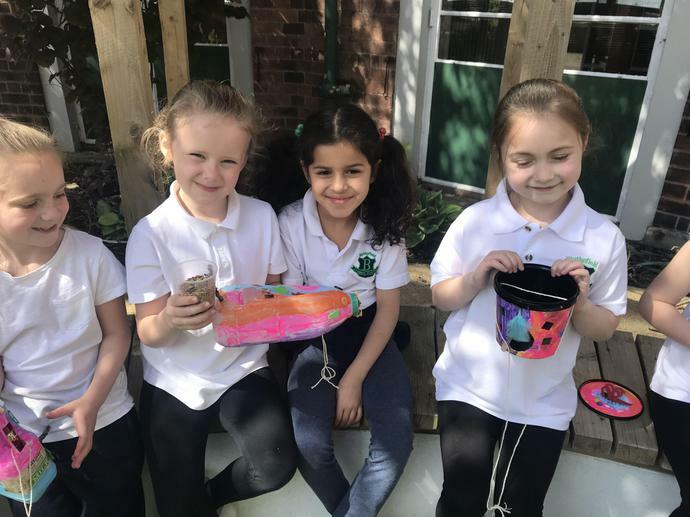 What a lovely sunny day to hang our handmade bird feeders in our school garden. 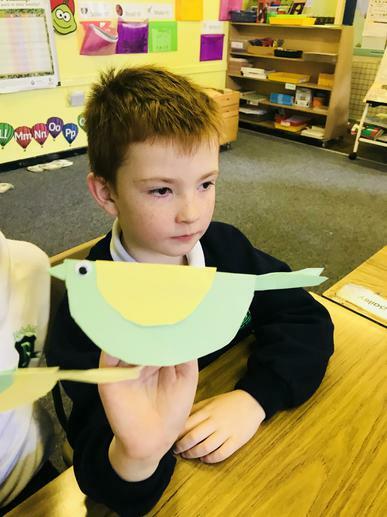 Primary Three loved this and can’t wait to see the birds enjoying these. 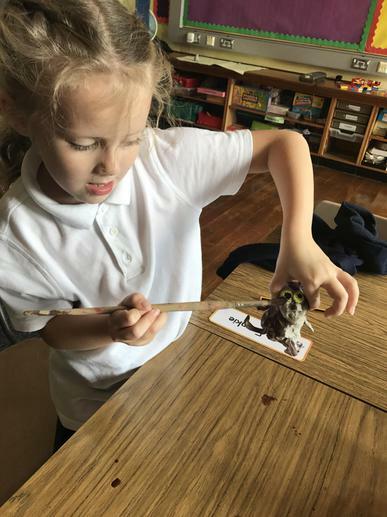 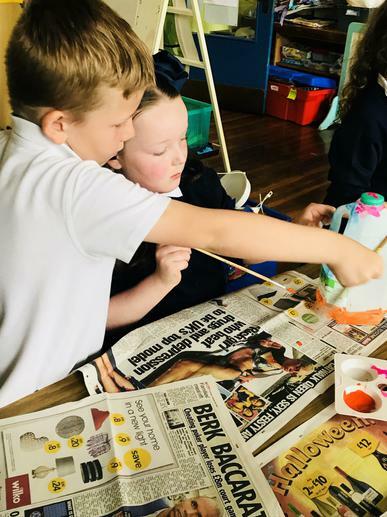 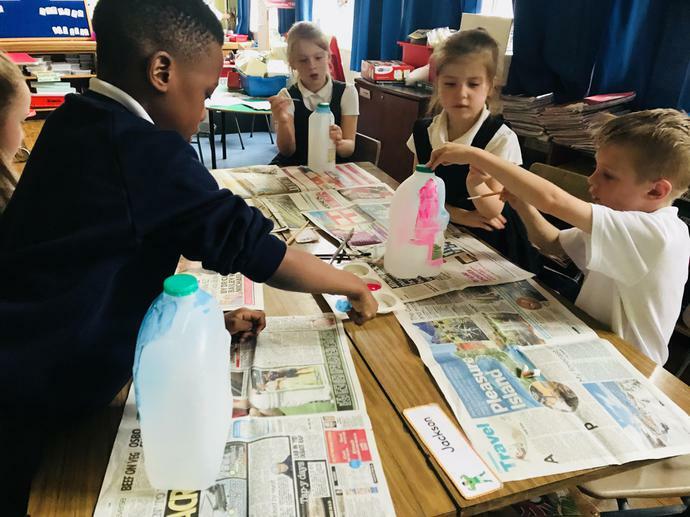 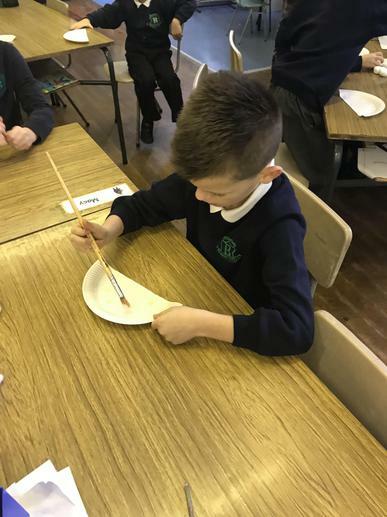 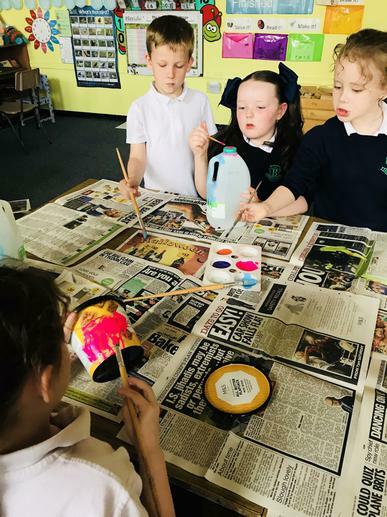 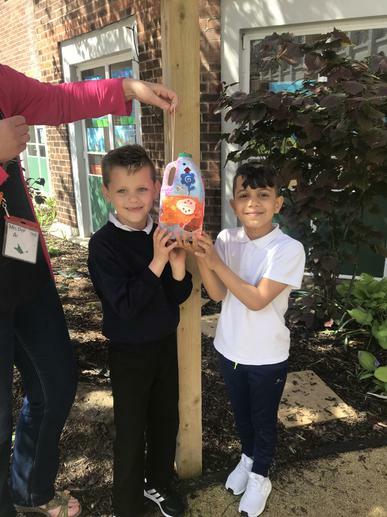 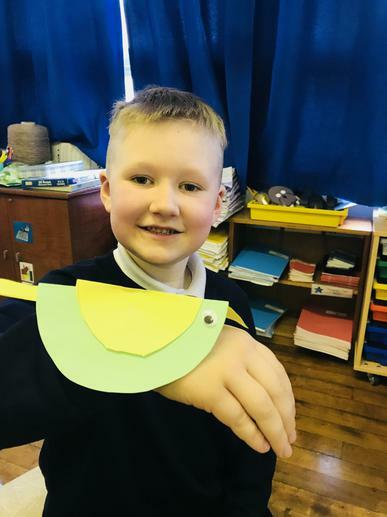 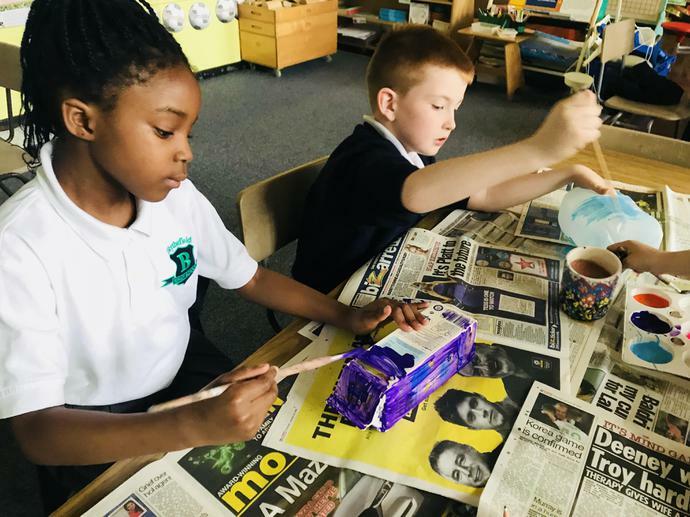 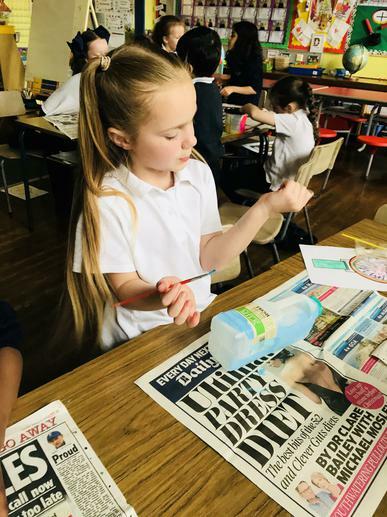 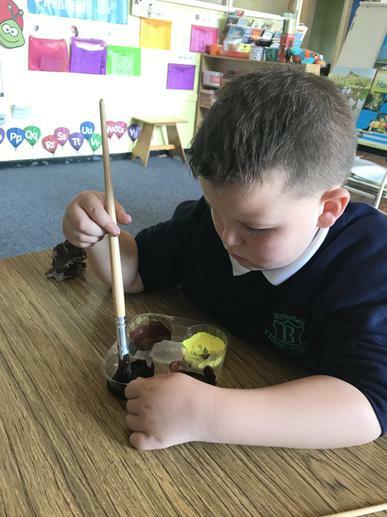 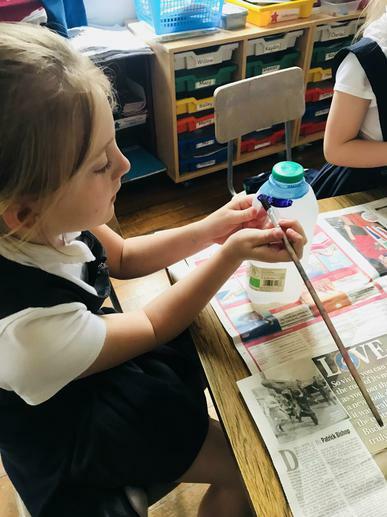 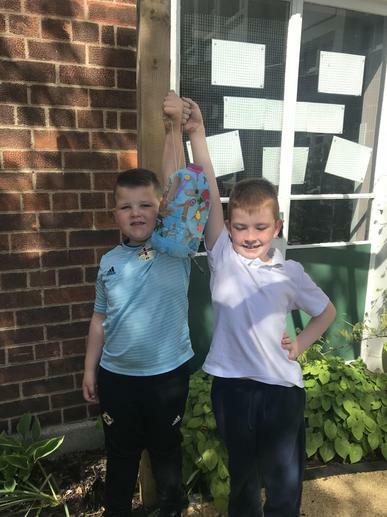 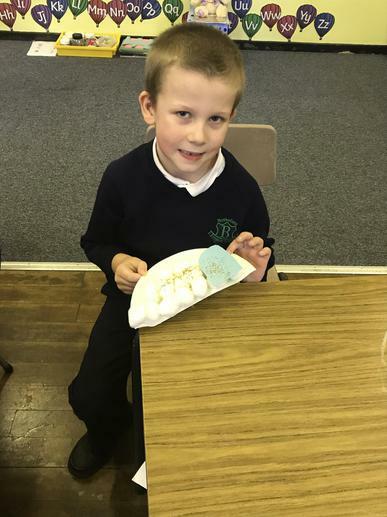 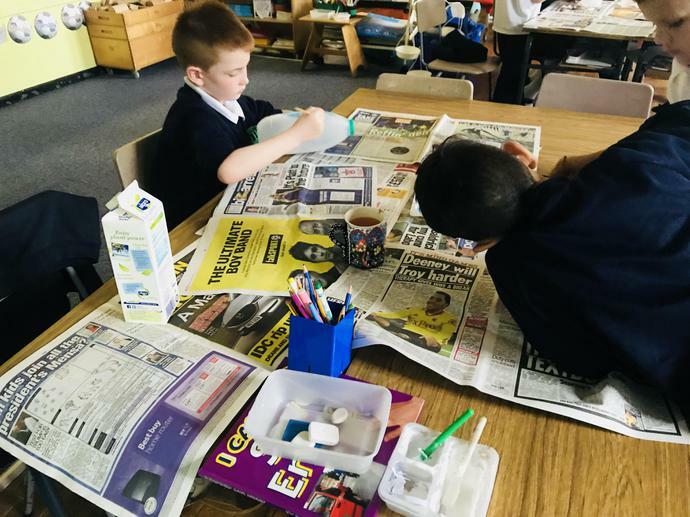 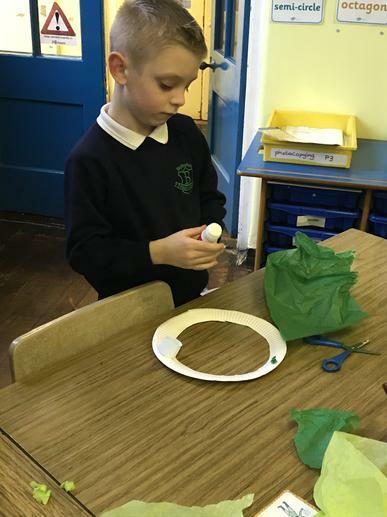 P3 started making their own bird feeders for our school garden. 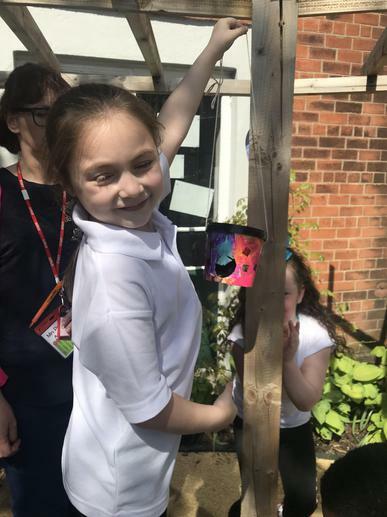 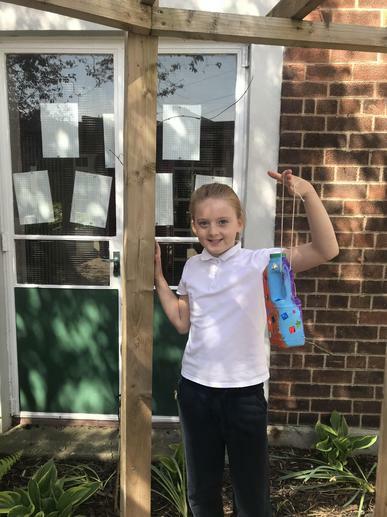 We can’t wait to finish these and hang them in the garden for all the birds to enjoy. 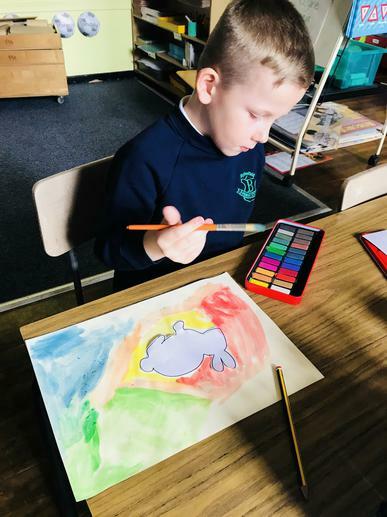 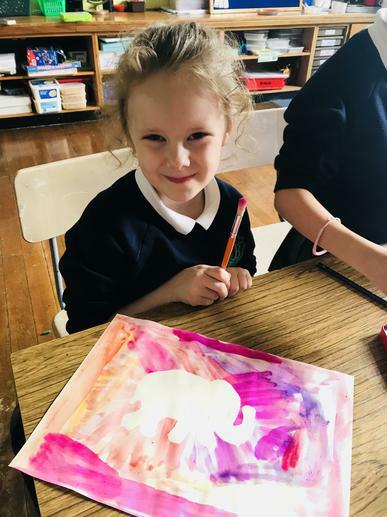 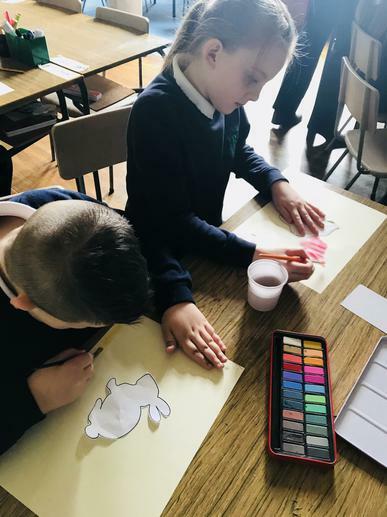 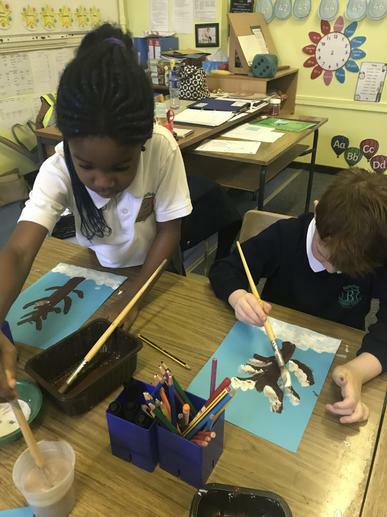 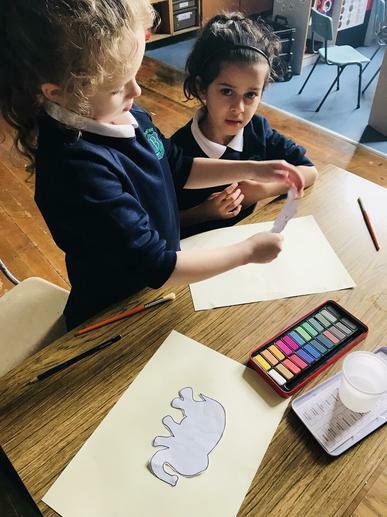 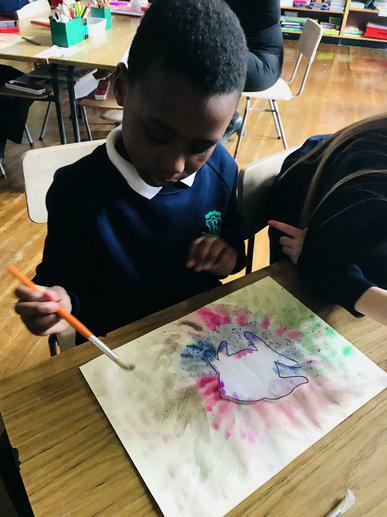 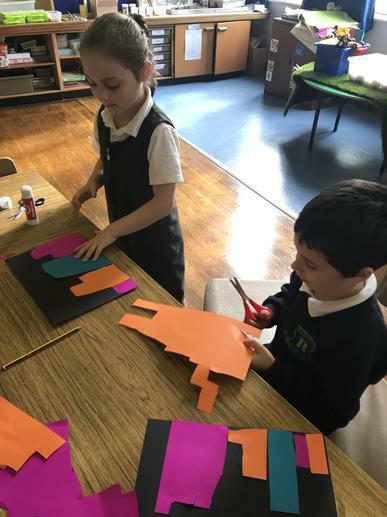 P3 created their own animal silhouettes using watercolour paints. 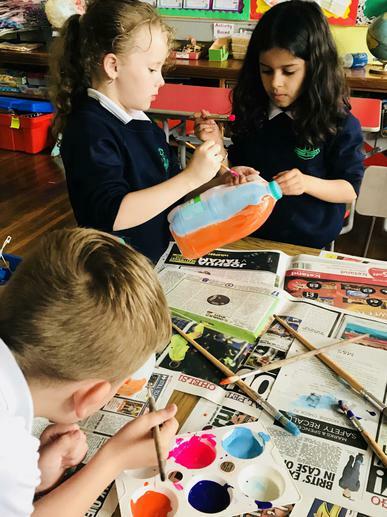 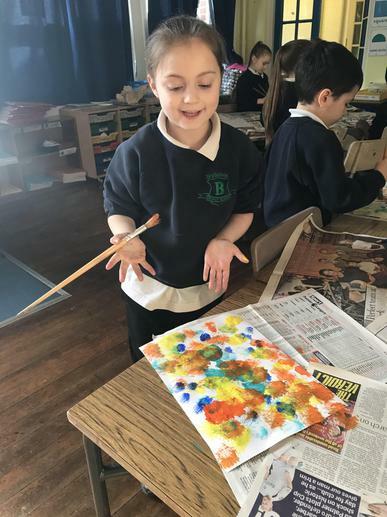 They explored how to blend colours, create texture and layer. 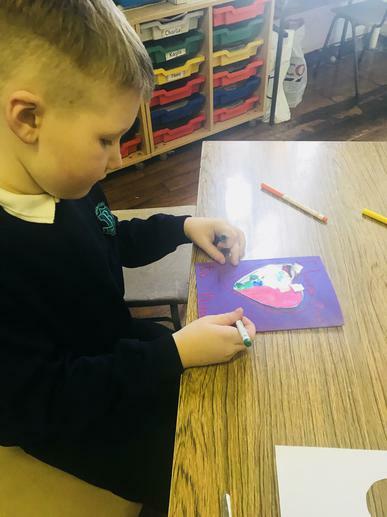 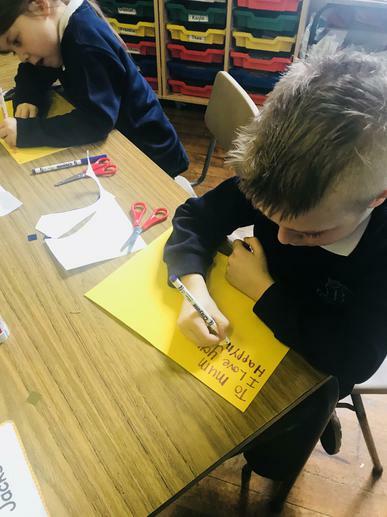 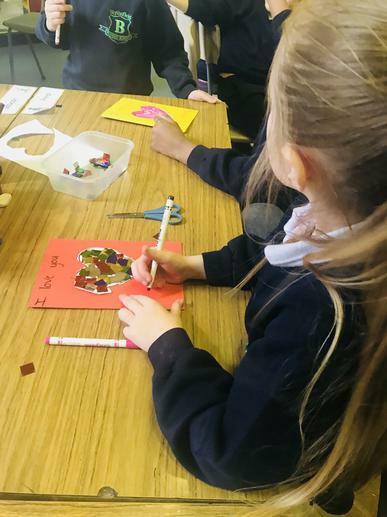 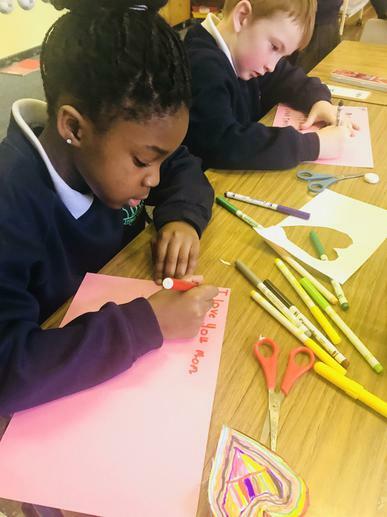 Primary Three enjoyed making Mother’s Day cards for their lovely mums. 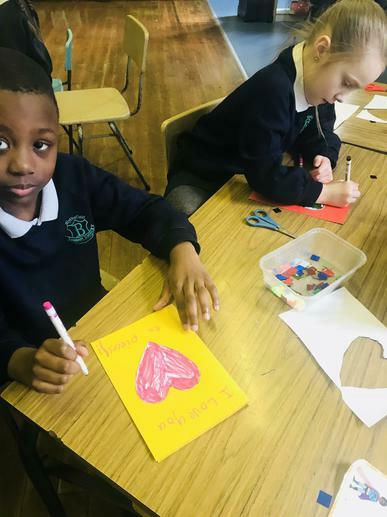 They can’t wait to surprise them with these gorgeous handmade cards. 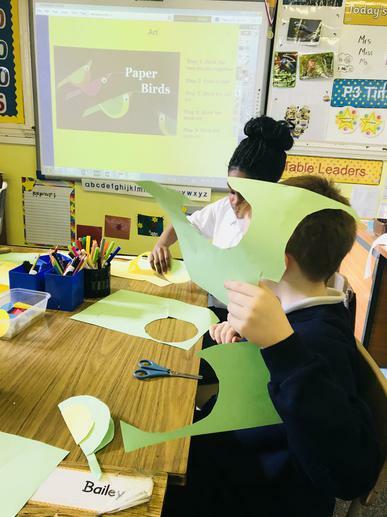 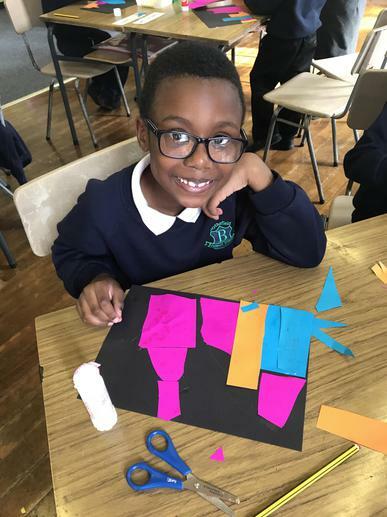 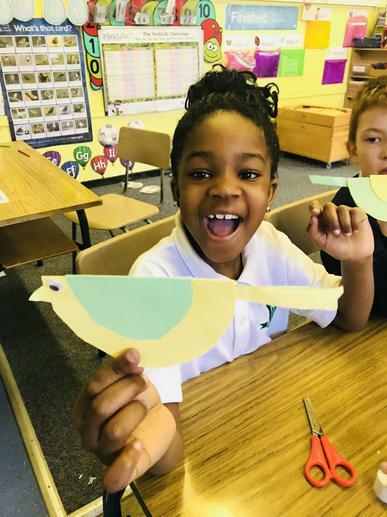 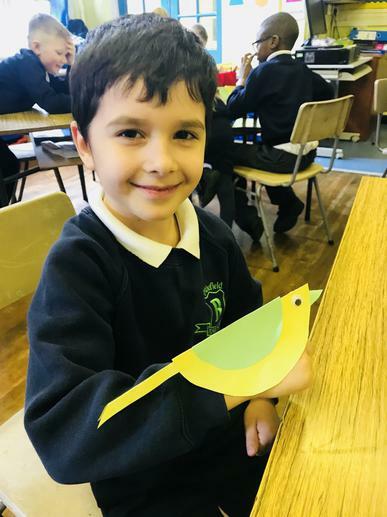 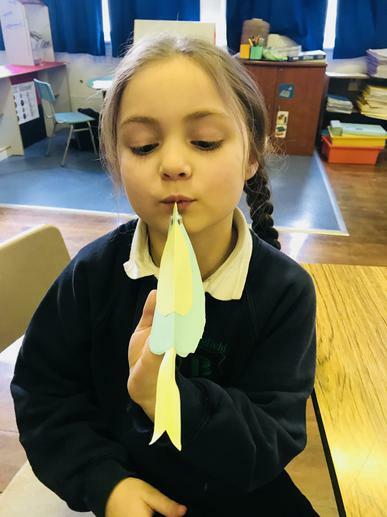 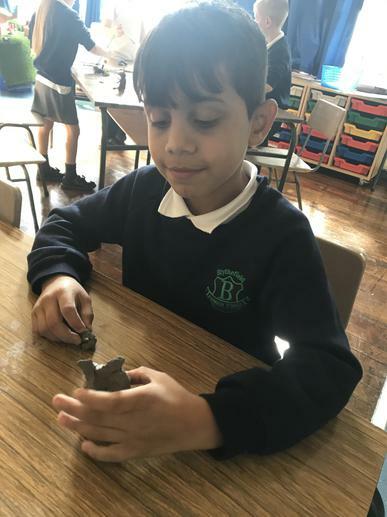 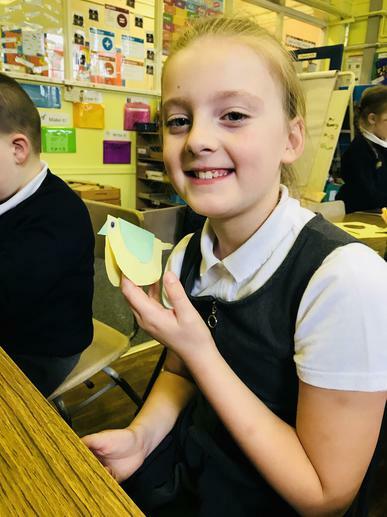 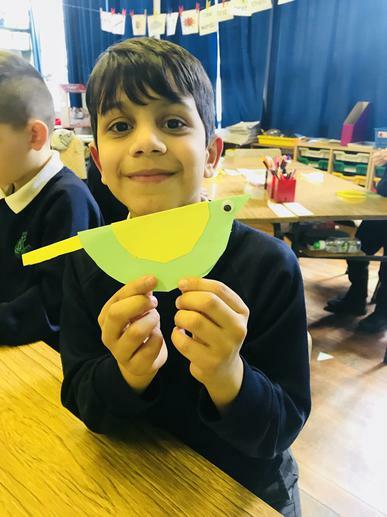 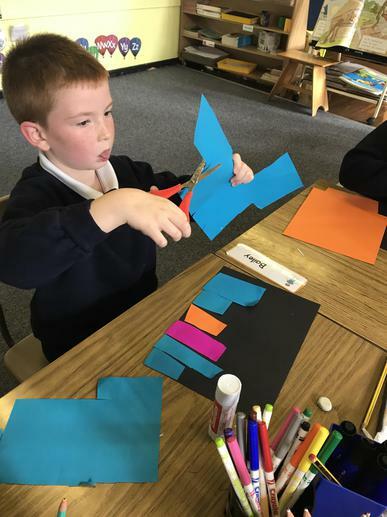 Primary Three explored how to make simple origami birds in Art today. 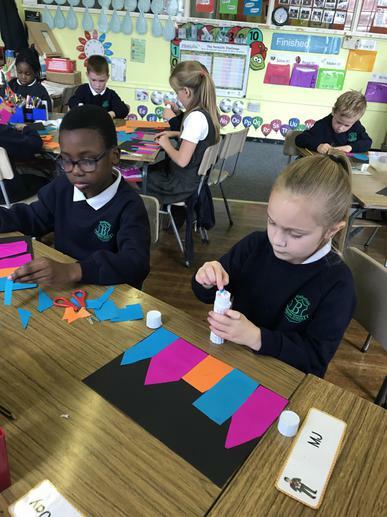 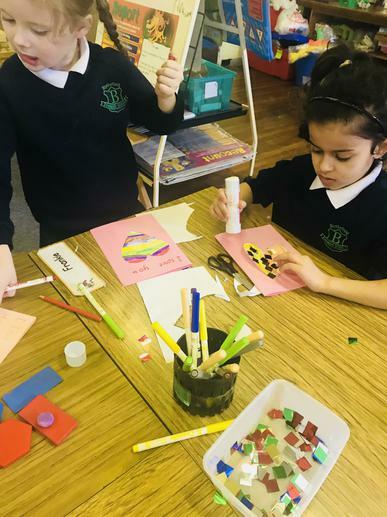 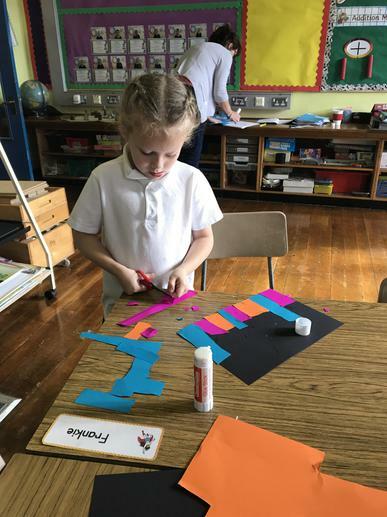 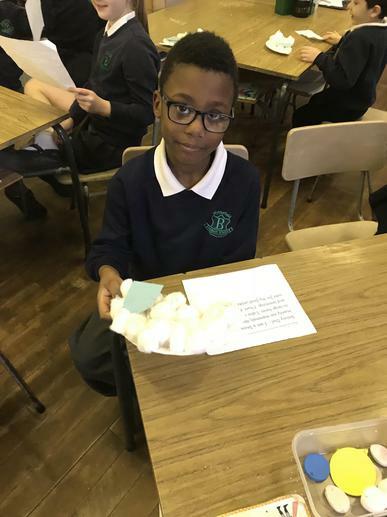 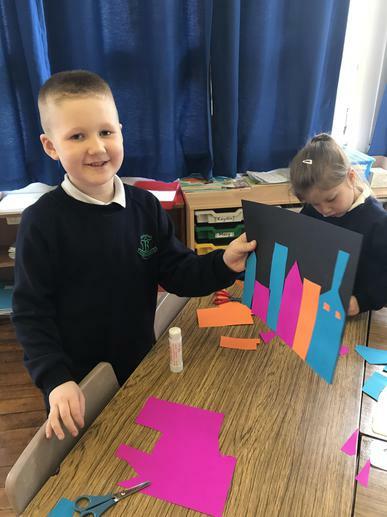 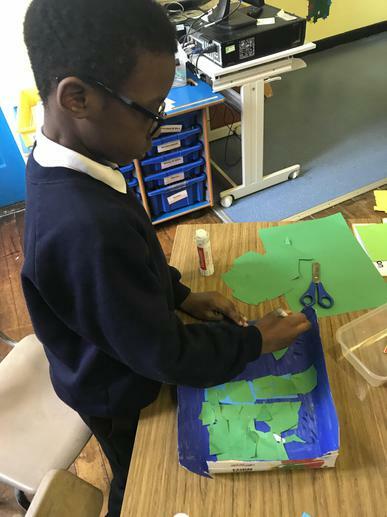 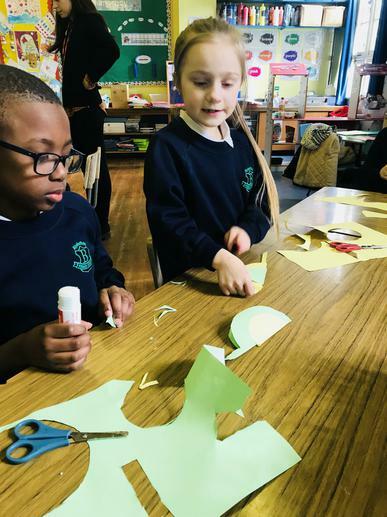 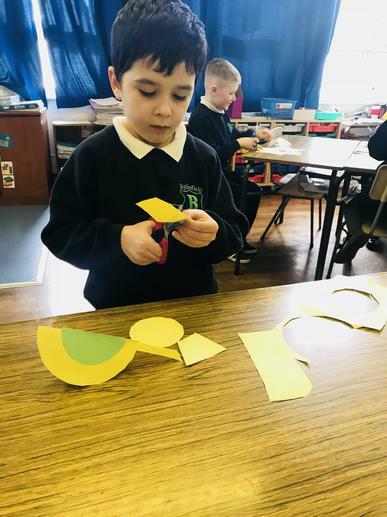 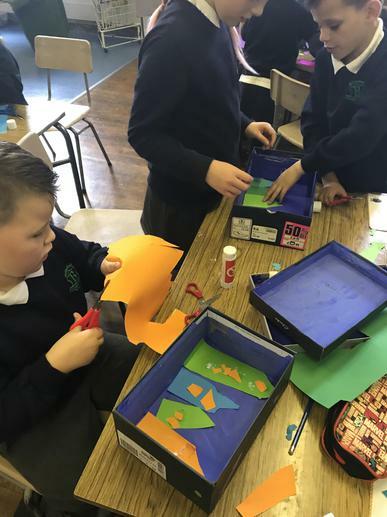 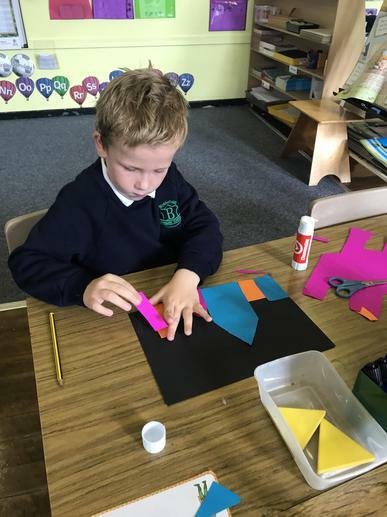 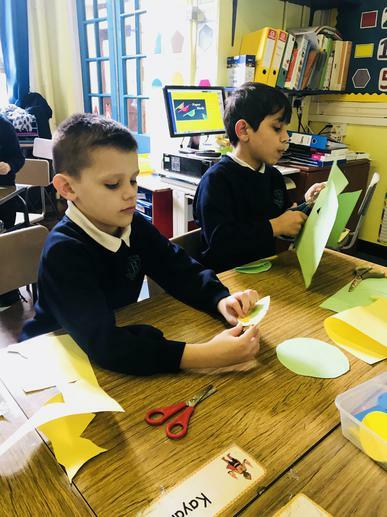 This art lesson helped P3 progress in their understanding of fractions through folding the paper and their problem solving skills. 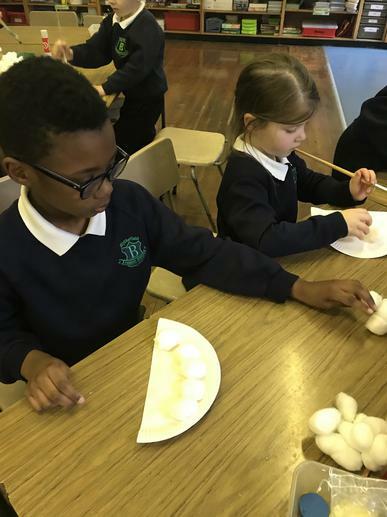 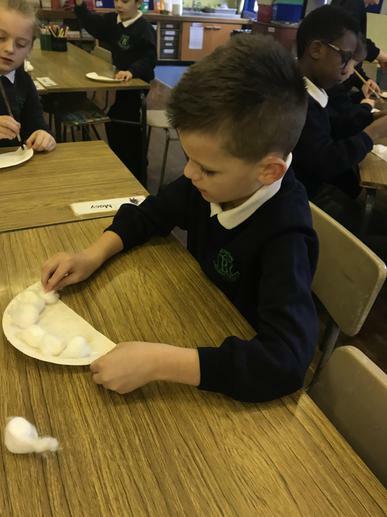 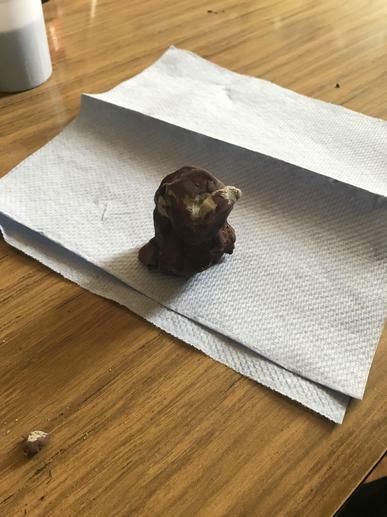 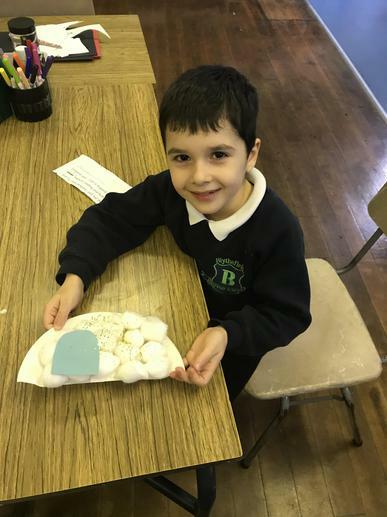 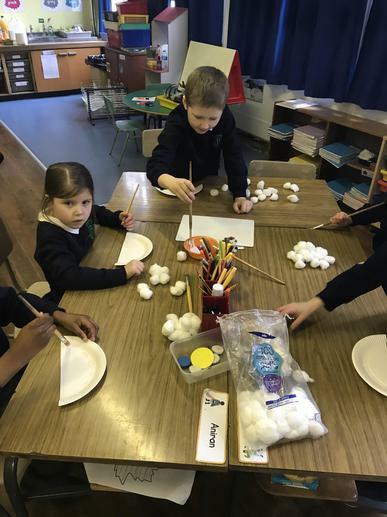 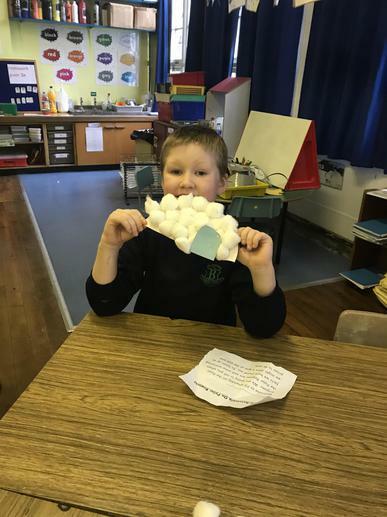 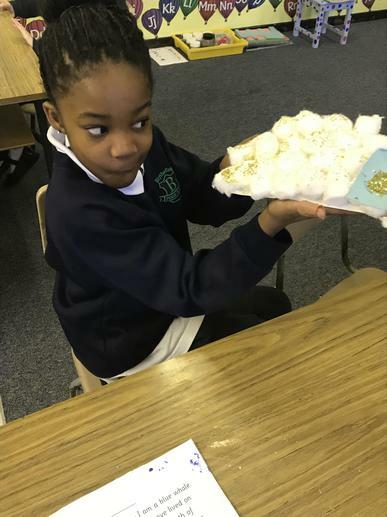 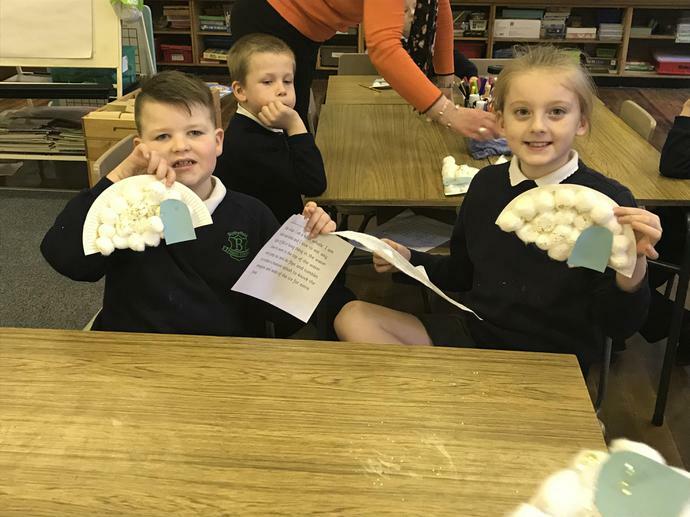 P3 made their own igloos in Art, we explored texture, shape and position. 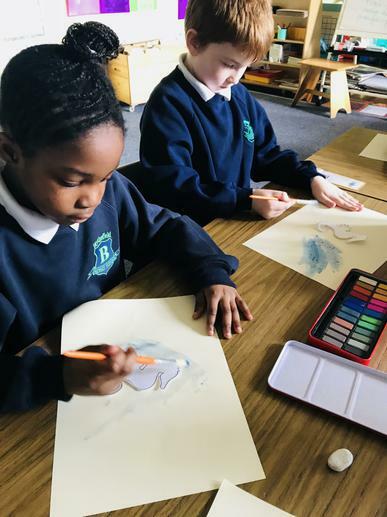 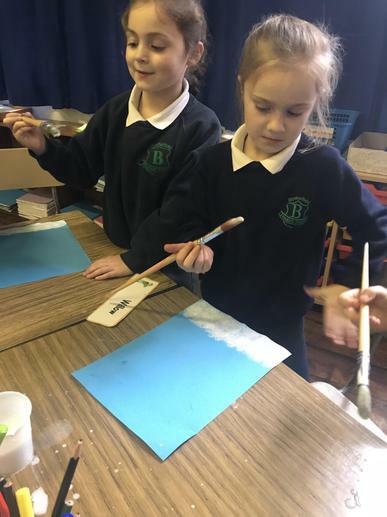 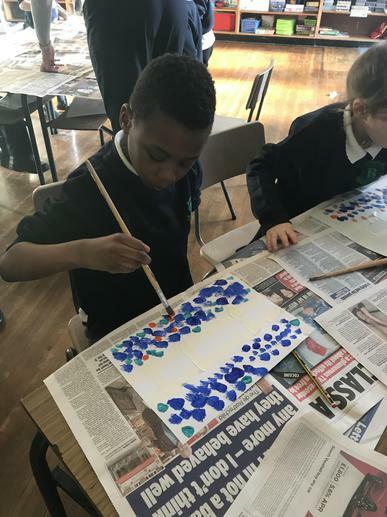 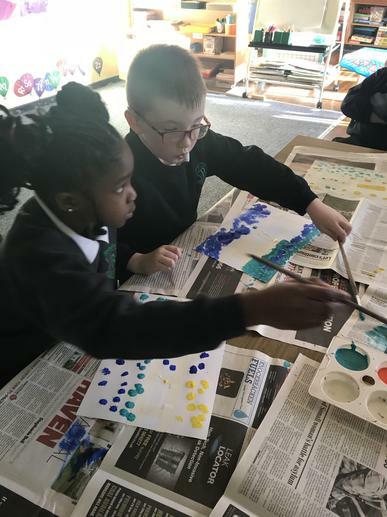 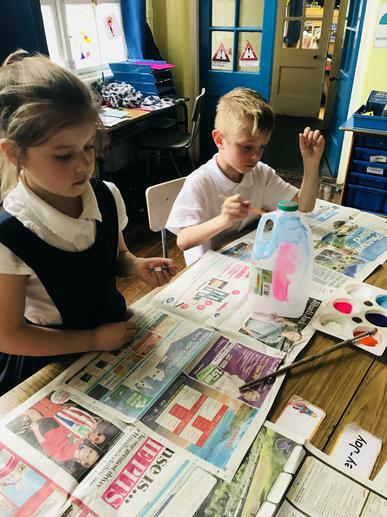 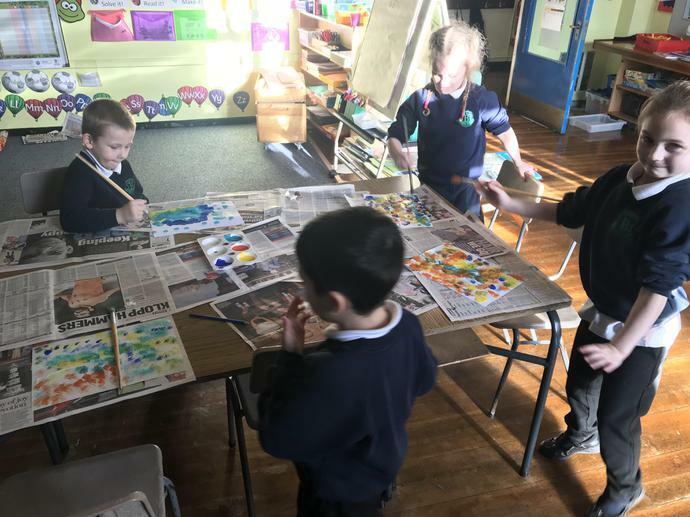 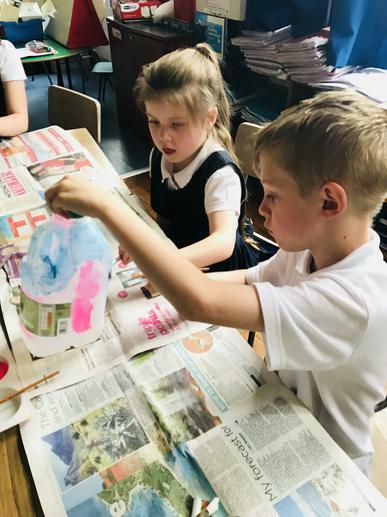 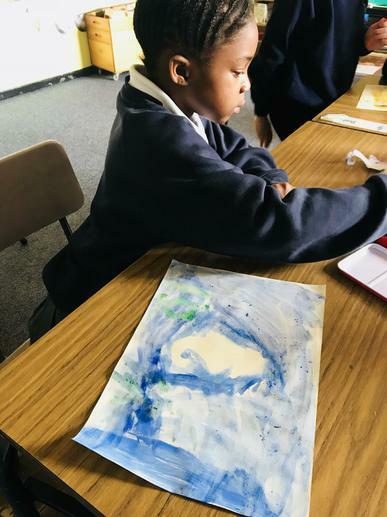 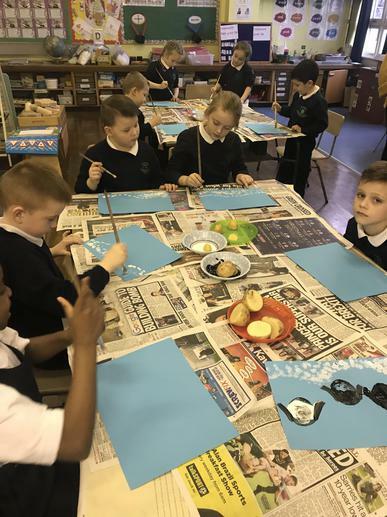 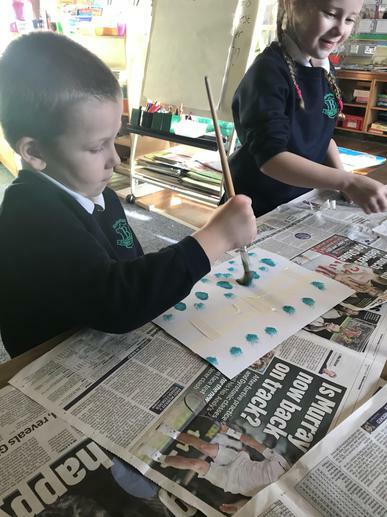 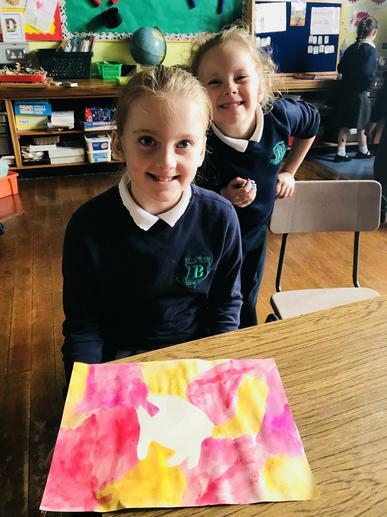 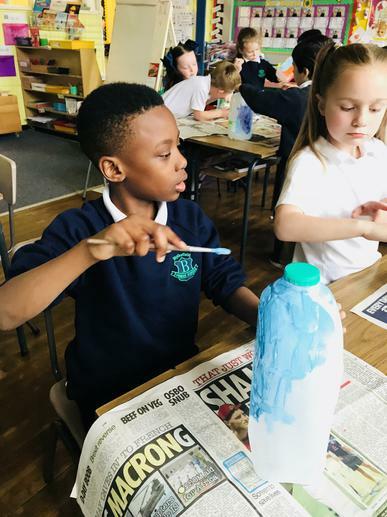 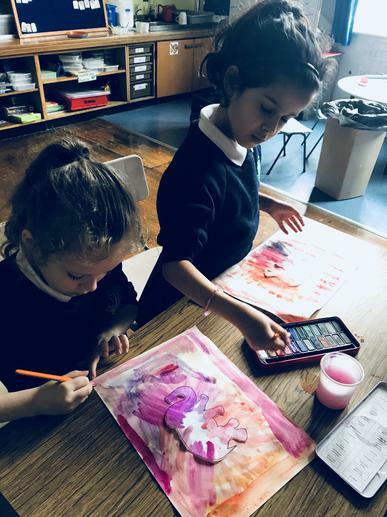 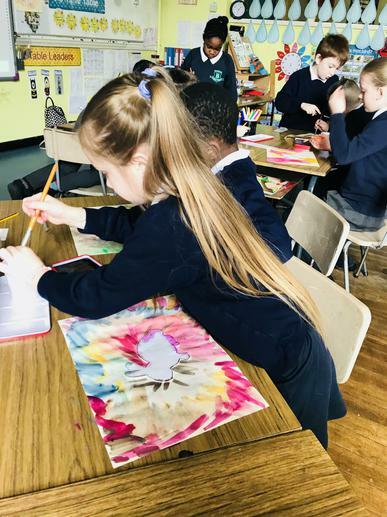 P3 have been researching the artist Claude Monet, in Art this week we chose to create our own interpretation of ‘The Water Lily Pond’ by Monet. 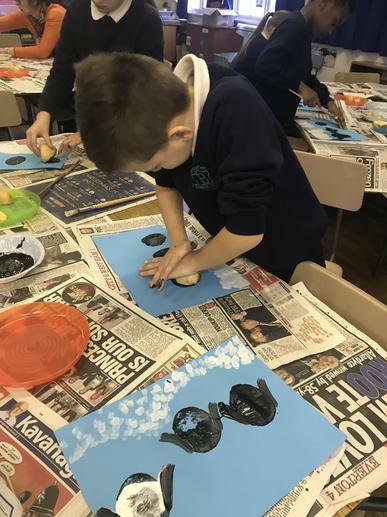 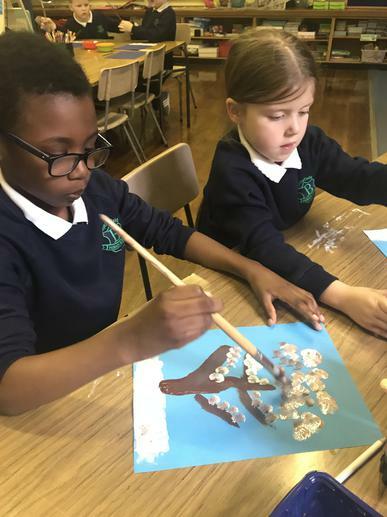 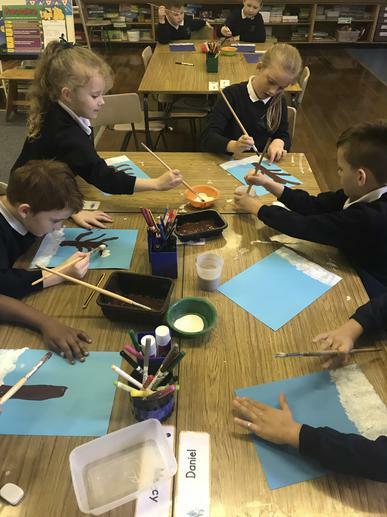 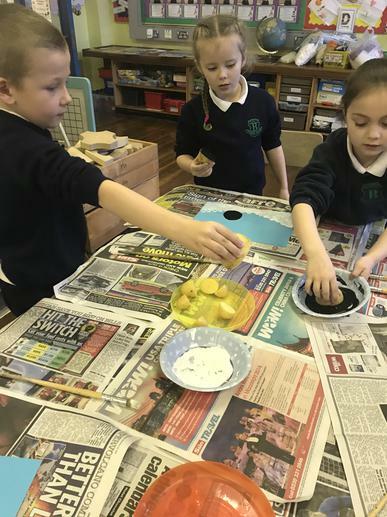 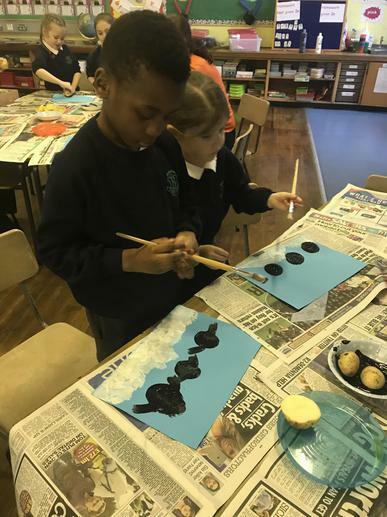 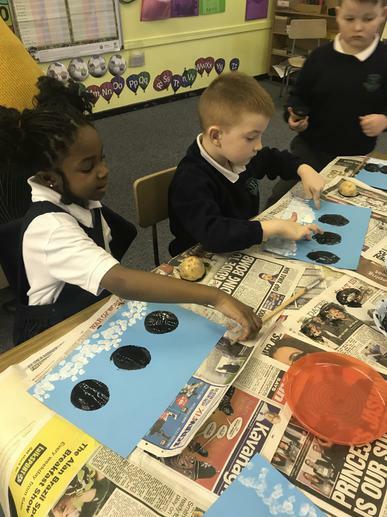 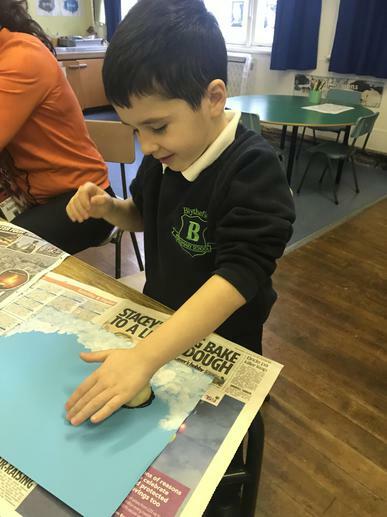 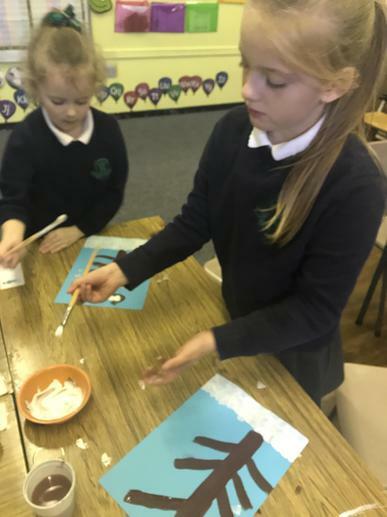 We are welcoming our new topic ‘The Polar Regions’ by designing our own potato print penguin paintings. 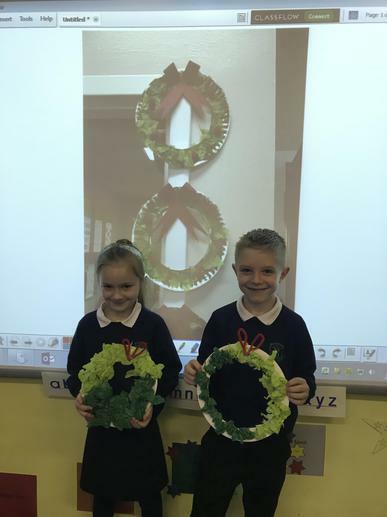 We think these will look wonderful on our display board. 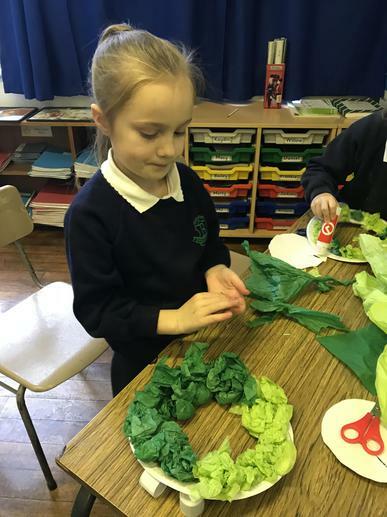 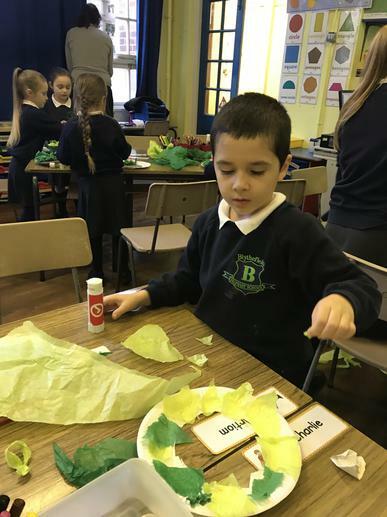 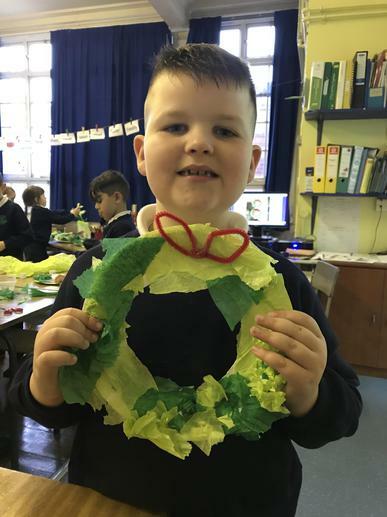 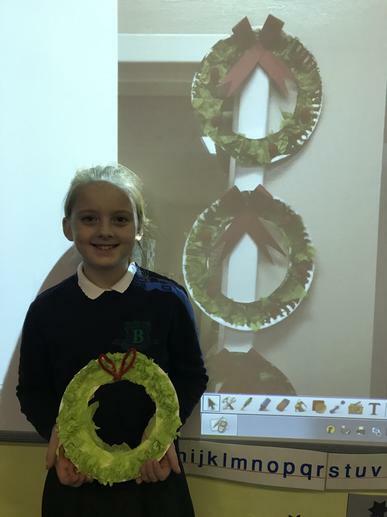 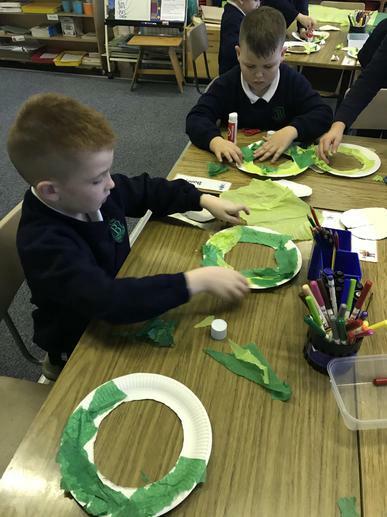 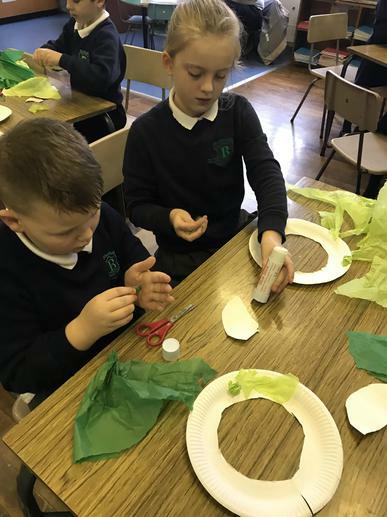 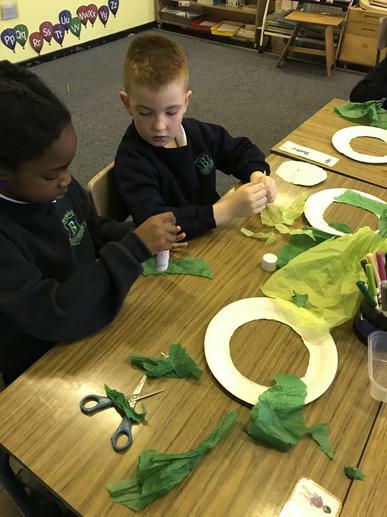 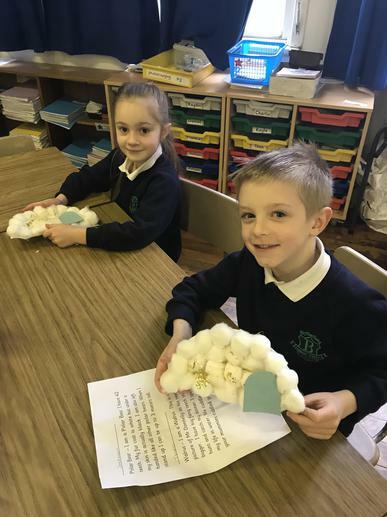 Primary three enjoyed making their Christmas wreaths during Art this week. 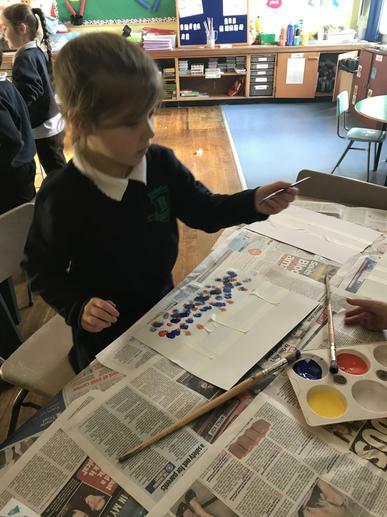 We explored colour combination and the effect of a range of mediums to produce different textures. 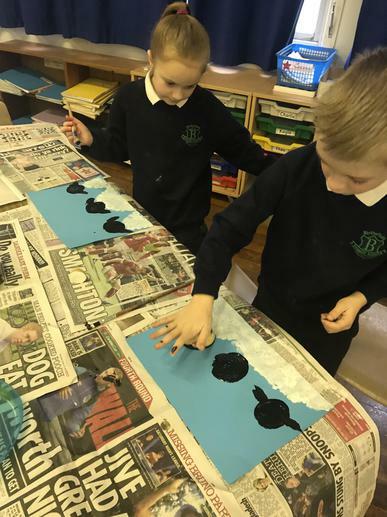 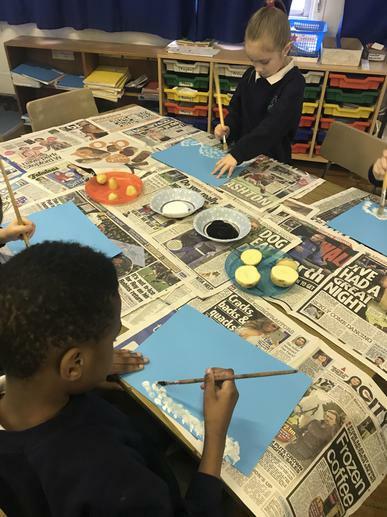 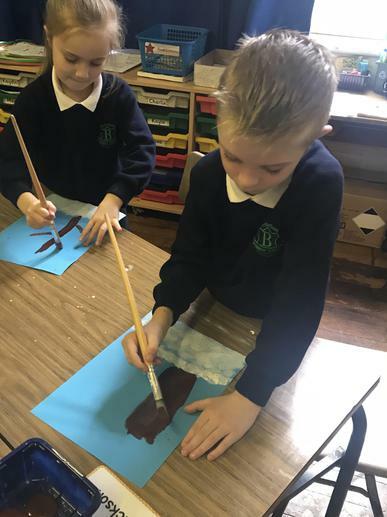 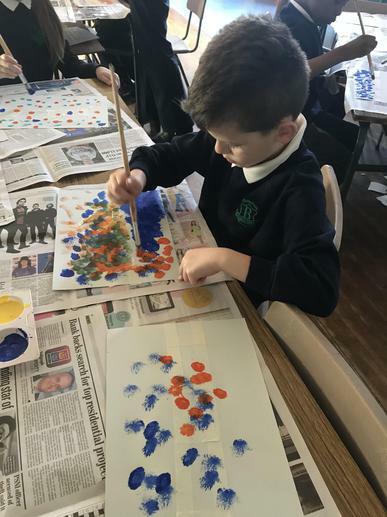 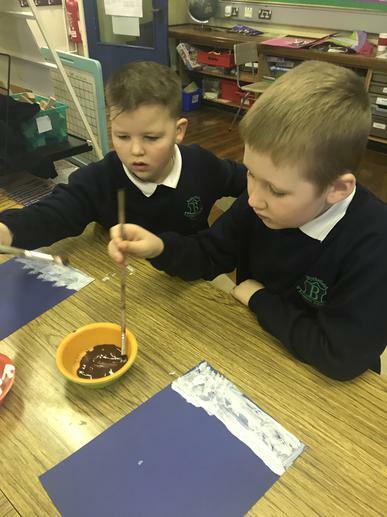 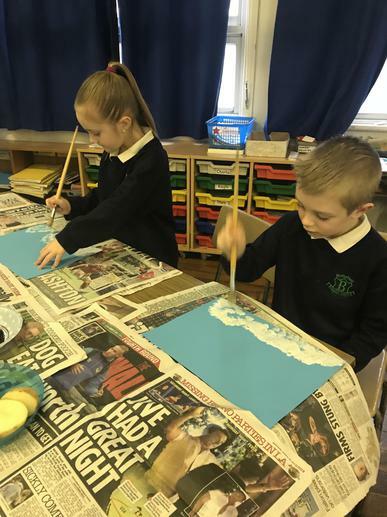 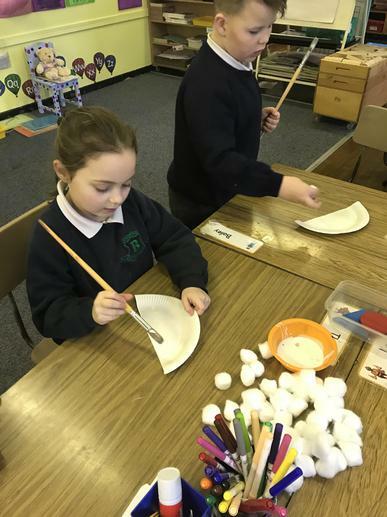 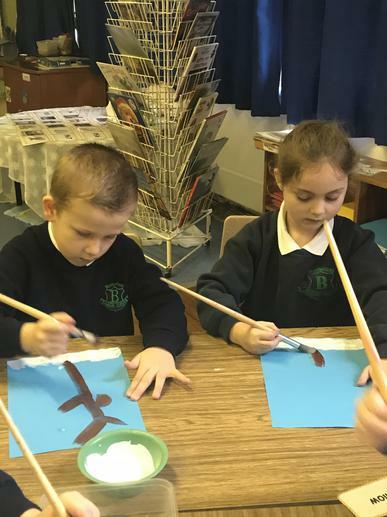 For our Winter theme in P3 we painted our own Winter Wonderland. 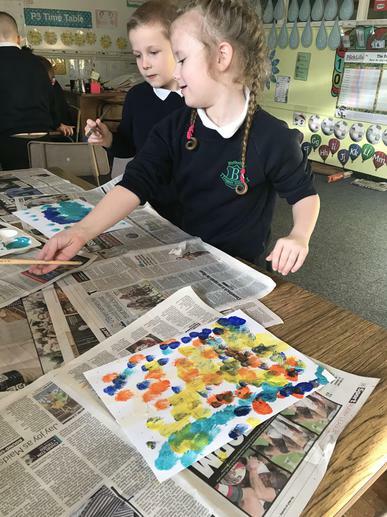 We explored different brush strokes to create different textures. 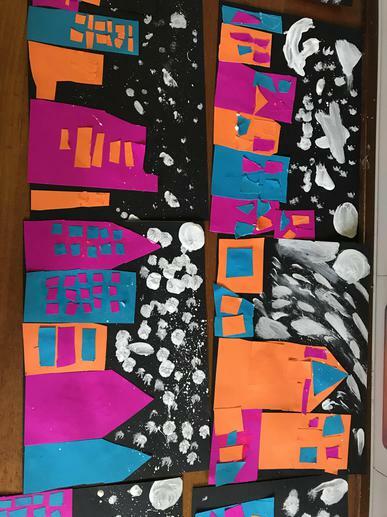 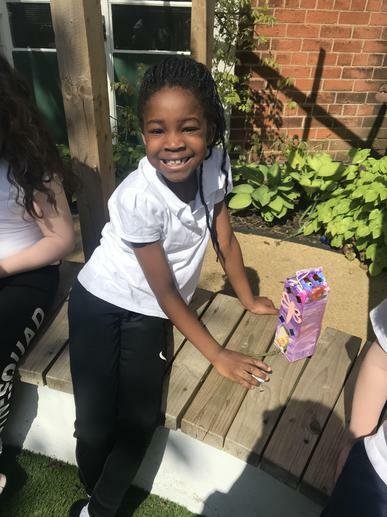 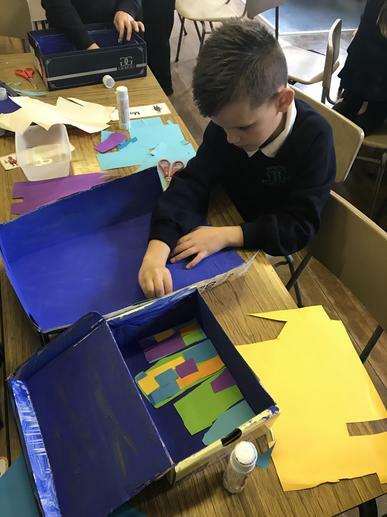 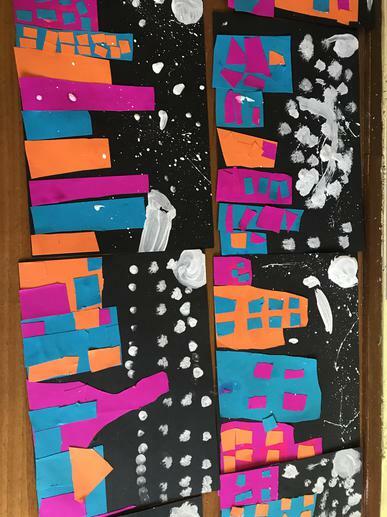 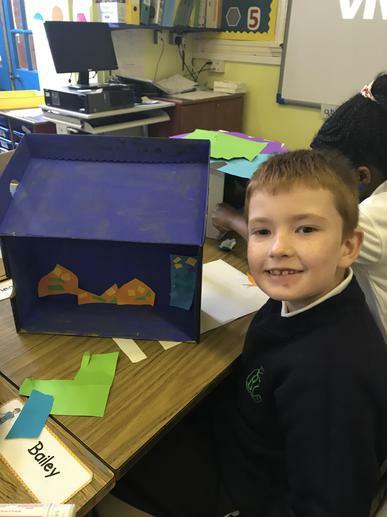 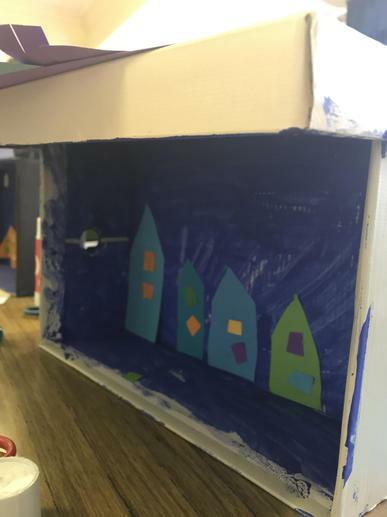 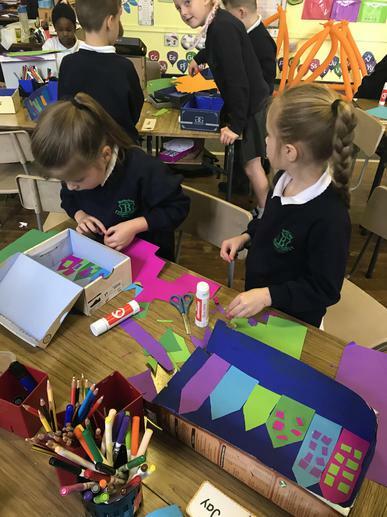 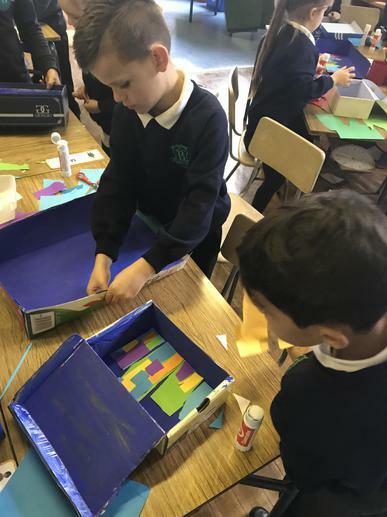 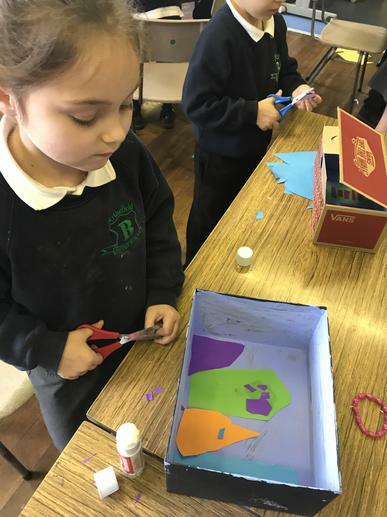 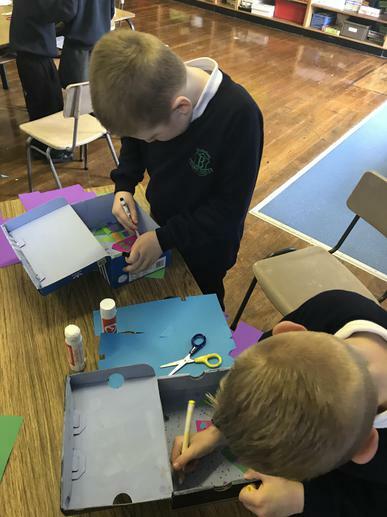 We have been learning all about homes and buildings, so for Art this week we made our very own shoebox city! 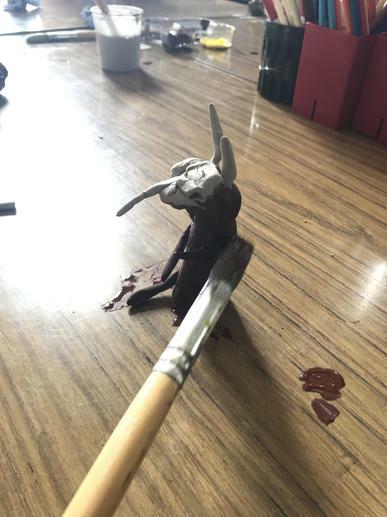 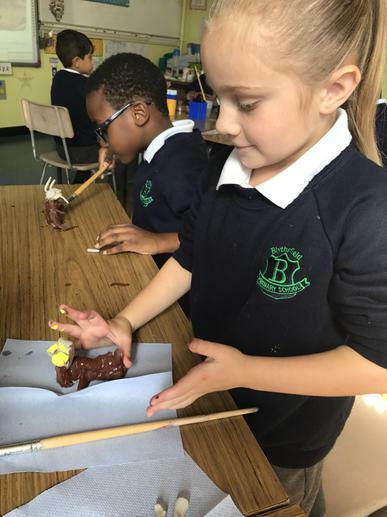 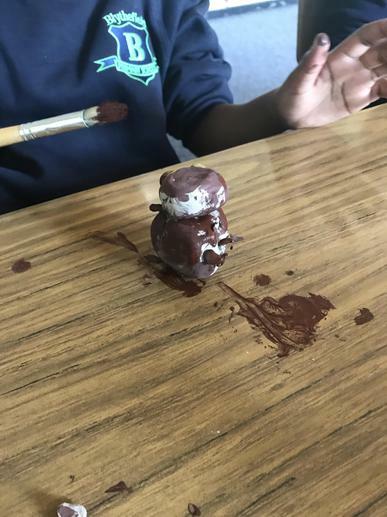 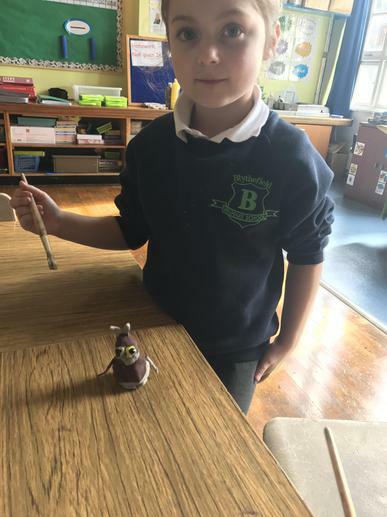 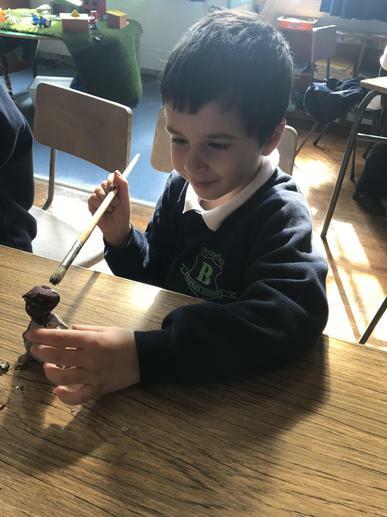 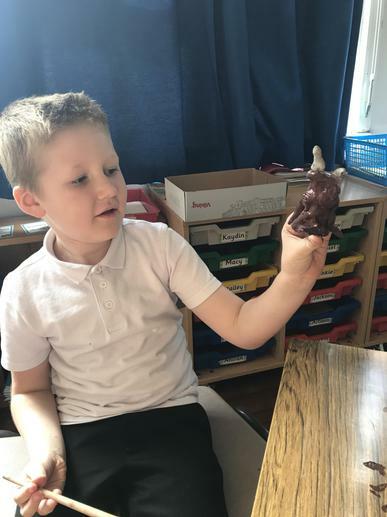 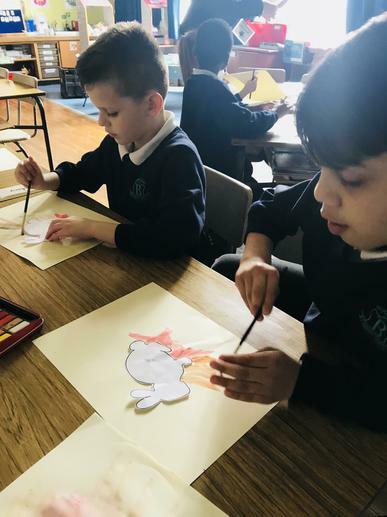 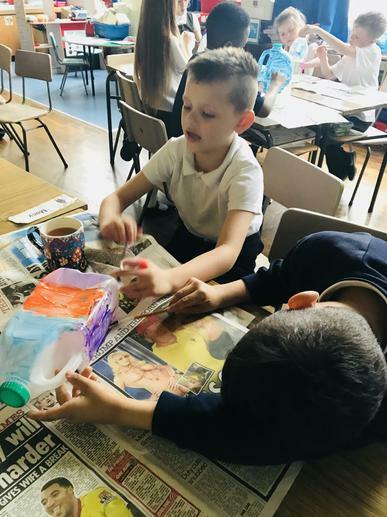 We had great fun In P3 during Art when we read the story of 'The Gruffalo' and made a Gruffalo each with clay and painted them after.